So, how many things do you 'have' that need to be renewed on a recurring basis. My license, I used to have my professional designation, memberships, library cards, passports ... ? And they often have some weird schedule. My passport is 10 years, but did I do it in 2012 or 2013 ... my license is on my birthday, but is it 4 years or 5 and when did I last renew it. Often we remember only too late. Thankfully some of the times the organization will remind us already, but others we may find out only too late. My friend was going on a trip and realized his passport had expired and to get it expedited was pretty hefty. 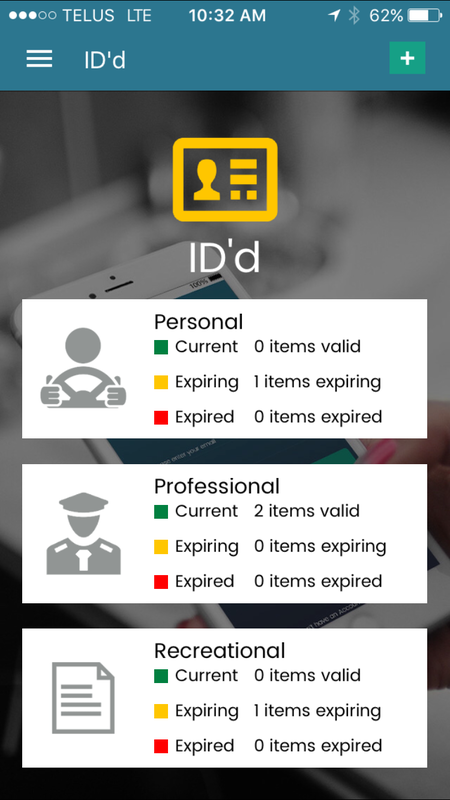 Well, enter ID'd, a Canadian app company that wants you to take a picture of your ID and then set the expiry. It'll then remind you (30, 60 or 90 days) before the expiry to help you remember. This will be great for my license plate tags, or my fishing license, outdoors card etc... Stuff I just plum forget all the time. The app is free, and sure, I probably could do this in Keep ... but this is something I can see all my 'licenses' just in one glance rather than searching through Keep for the variety of bits.